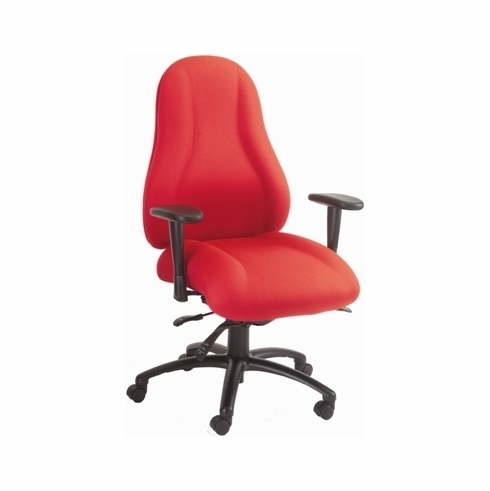 Introducing the Atlas heavy duty office chair from Ergocraft. Atlas was designed to withstand the toughest of office environments while providing you with maximum comfort. Atlas features include an overstuffed contoured seat and backrest, full support high back backrest, waterfall seat edge to help promote proper circulation, commercial grade stain resistant upholstery, ratchet style backrest height adjustment, seat and back angle adjustments, seat slider for seat depth adjustment, pneumatic seat height adjustment, 360 degree swivel, adjustable T-shape armrests and a heavy duty nylon base with dual wheel carpet casters standard. Optional steel base upgrade available. Atlas meets or exceeds ANSI/BIFMA standards. Dimensions: Seat Size: 22.25"W x 22"D. Back Size: 22"W x 27"H. Overall: 44" - 52.5"H x 28" - 32"W x 26"D. Weight: 68 lbs. 12 year limited warranty from Ergocraft. This chair normally ships within 5-6 business days from our CA warehouse.